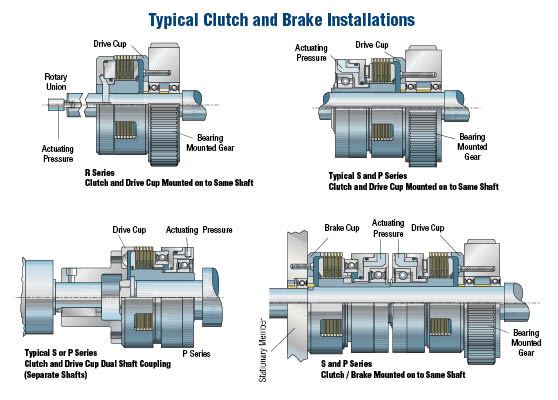 Logan Fluid or Air actuated clutches, brakes, and clutch-brake combinations are used in a wide variety of Machine Tool, Industrial, Marine, Municipal, Mining and Off-Highway applications. 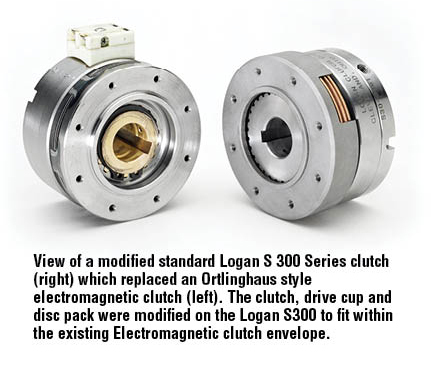 Our attention to quality and service, along with the ability to modify standard units to meet specific customer needs, has led to the success and growth of Logan Clutch Corporation. The Standard Logan product line is described in this catalog. It consists of three series of clutches and brakes with design features that are beneficial to their installation, operation and maintenance. Each series has model sizes with friction discs ranging in diameter from 2.5 inches (64 mm) to 8 inches (203 mm). All models can be furnished with standard lug or gear toothed friction discs. An overview of their torque capacities and typical configurations can be viewed on pages 7 and 8. 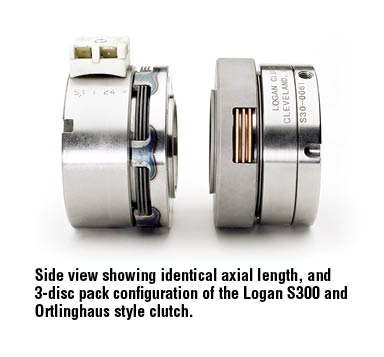 Logan Fluid or Air actuated clutches, brakes, and clutch-brake combinations are used in a wide variety of Machine Tool, Industrial, Marine, Municipal, Mining and Off-Highway applications. 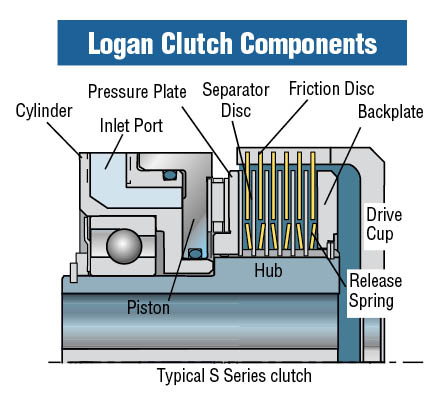 Our attention to quality and service, along with the ability to modify standard units to meet specific customer needs, has lead to the success and growth of Logan Clutch Corporation. 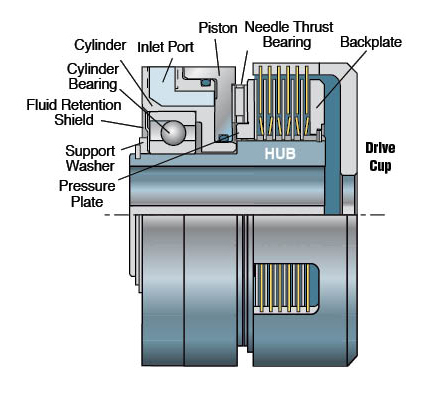 When used as a clutch, the hub is keyed to the drive’s shaft. 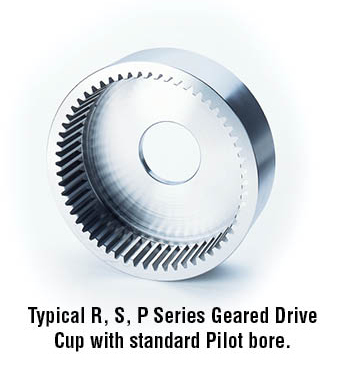 The drive cup is attached to a bearing mounted gear, sprocket or sheave, which can freewheel about the same shaft. 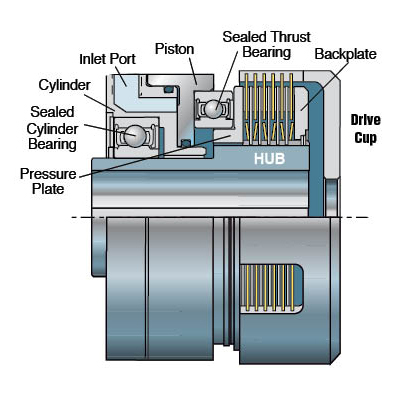 The hub or the drive cup can be the driving or driven member. The above arrangement is used to transmit torque between two parallel shafts. When torque must be transmitted between in-line shafts, one half of a flexible coupling is used to connect the bearing mounted drive cup to the other shaft. When S and P units are used as a brake, their hub is keyed to the shaft to be stopped. The drive cup is held stationary by the drive’s supporting frame. 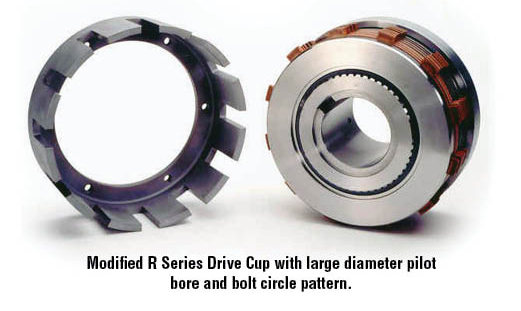 The R series allows either it’s hub or drive cup to be the stationary member. 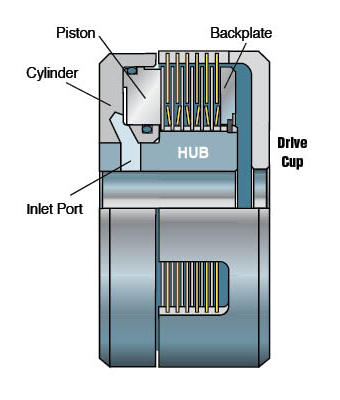 An external cylinder port is provided when the hub is held stationary. Pressurizing the cylinder with fluid or air forces the piston to clamp and lock the friction and separator discs. Torque is transmitted through the interfaces between hub and separator disc splines, separator and friction discs, and friction disc tangs and drive cup slots. When pressure is removed, the release springs separate the separator discs and maintain a running clearance between separator and friction discs. Self-adjusting™piston travel compensates for any disc wear, eliminating the need for mechanical adjustment (i.e. levers, linkages, and yokes). The amount of hydraulic or pneumatic pressure applied regulates the amount of torque transmitted through the clutch. Push-button, remote activation from a control panel, marine wheelhouse or cab is now possible. R and S Series: Logan R and S Series Clutches and brakes are designed primarily for wet operation within gear boxes and transmissions. They can be partially submerged in an oil sump or an oil splash or spray can be directed on the outside diameter of the disc pack. This wet operation aids in dissipating the thermal energy generated at the disc friction interfaces. 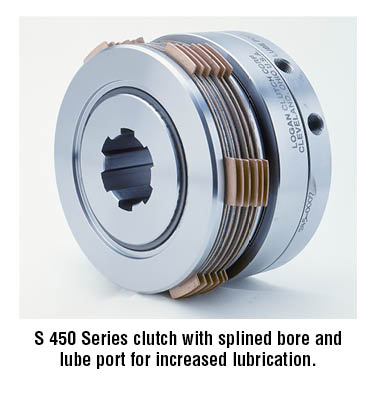 S series units require lubrication of the cylinder and thrust bearings. Usually, the oil splash or spray directed at the disc pack provides sufficient lubrication. Lube ports are available for specific applications. P Series: P series clutch bearings are greased and sealed and do not require external lubrication. Torque ratings are based on dry operating conditions. Logan Clutches and brakes do not require linkages, levers, or adjusting collars. At drive system service time, in-stock disc pack kits, seal kits, and bearing repair kits, along with factory installation data sheets make maintenance quick and easy. Factory reconditioning is also available. The actuating cylinder and piston in the S series design do not rotate. They are bearing supported on the mounting hub and are held stationary by the external connection to the inlet port. This bearing allows the separator discs and hub, and the shaft on which it mounts, to rotate about the cylinder and piston. A thrust bearing permits relative motion between the stationary piston and rotating separator discs. Because both bearings require lubrication, it is important to utilize lube ports provided and/or direct an oil spray or splash at bearing surfaces. The P Series design is similar to the S Series, which is designed for wet operation. The P Series is designed for dry operation – bearings are pre-lubricated and sealed and do not require external lubrication. Torque ratings are based on the P Series disc pack operating in dry conditions – thus requiring lower actuation pressure to achieve high rates of torque. The P Series is ideal for light duty applications with low actuation frequency and low inertia. The R series design provides maximum torque within a small envelope. In the R Series design, the piston and actuating cylinder, which is integral with the mounting hub, rotate. Bearings are not required. The shaft on which the hub mounts is rifled and cross drilled to provide passage for the actuating media. A press fit or cap seals are necessary to prevent media pressure loss due to seepage past the hub and shaft interface. Although the R series design can withstand high rotational speeds, consideration must be given to disengaging and freewheeling speeds when the units are hydraulically actuated. Review the maximum disengaging speed for each standard model (see page 6). Logan Drive Cups are manufactured to perform in harsh conditions. Contact surfaces are heat treated to ensure long life. Standard cups are furnished with 1” and 2” diameter pilot bores. All models can be furnished with standard lug or gear toothed configurations. Bolt Circle patterns, bores and axial lengths can be modified to meet specific design requirements. 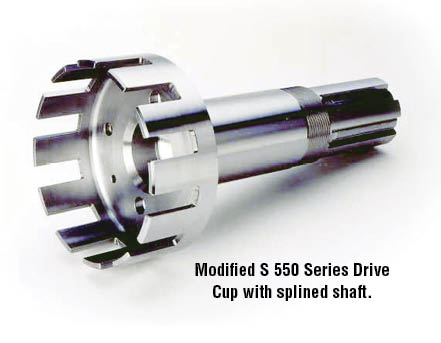 Drive Cups can be designed and manufactured to be integral with shafts, gears, couplings and stationary members (when used as a brake cup). Logan has the design and manufacturing capability to replace existing and obsolete electromagnetic clutches with Logan technology.